Suppose a highly-respected industry trainer were to sit down with you and your entire staff and patiently explain, point by point, everything he had learned in 25 years in our business. Suppose he would be available for discussion whenever you wanted a review, and that he would repeat his initial presentation to every new person you hired. What if he would do so for practically no charge? How much would that improve the production of your entire operation? 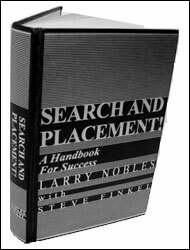 That is exactly the situation you’ll enjoy with the remarkable new 300-page hardbound book “Search and Placement! A Handbook for Success”, by Larry Nobles, edited by leading author and trainer Steve Finkel. Larry Nobles will be no stranger to The Fordyce Letter subscribers or to the industry in general. Over a long career as top national trainer with a major franchise and as an independent, he addressed virtually every association, franchise and chain in our industry on multiple occasions. There are literally thousands of successful consultants at firms he has trained, who have heard him speak, or have benefited from his fine audios who owe much of their success to Larry. He passed away several years ago, but the respect and accolades he received for his expertise were well-earned. On his passing, Steve Finkel arranged to continue the marketing of Larry’s outstanding 24 module CD program. Over the past year, he has carefully compiled all of Larry’s material, many articles written, notes and outlines of Larry’s programs, plus personal notes of their in-depth conversations. Through a truly masterful editing job, the result is the most comprehensive well-written modern training manual and reference guide ever produced for our industry. The convenient hardbound book format allows it to be available quite inexpensively. It is difficult to summarize such an extensive work. The complete table of contents is posted at the website listed below. The book begins in the Introduction with an outstanding discussion of why our business is, as Larry says, “the best business in the world”. New people will be excited and experienced ones re-invigorated with the thoughtful presentation of the vast merits of our industry. And then comes the content…. From Organizing Your Desk to Planning to multiple chapters on Marketing and Recruiting, this book flows. Written in the first-person, Larry Nobles explains how to Prepare and Coach Candidate and Client, Follow-up with both, Overcome Objections, Close, and much more. The depth of the material in this 318-page book and the clarity with which it is presented is absolutely first-rate. There is no step of search and placement which is not covered thoroughly and well. To pick one example, there is an entire chapter on “Negotiating the Offer”. Does your firm negotiate offers between candidate and client before they are extended to increase acceptance rates? Many do not, and lose fees as a result. Larry Nobles is a master at it. The placement completed, the next three chapters focus on developing the client from a simple one-time fee to a long-term repeat client with exclusives. “Don’t just put the deal together”, says the author, “Put a brilliant career together!” In this book, one of the most respected industry leaders will show you how. The picture of the author has a Walt Whitman quote beneath it. “My friend, this is no book. Who touches this, touches a man.” Nothing could say it better. This writer knew Larry well throughout his career. In this book, Mr. Nobles sits down with you and patiently explains through clear principles, specific script, solutions to problems, and personal examples exactly how this business works and how to become and stay successful. It is also a superb foundation for sales meetings. Every consultant should have the next chapter read, highlighted, considered by the time of the next meeting. Your entire firm should discuss this book on a chapter-by-chapter basis with each consultant preparing by reading the chapter to be discussed in his own book before the meeting. Then start over. There is that much material there! Don’t think of this as “basic” training; 318 pages is not basic! Rather, it is an essential on-going permanent reference work each recruiter should have on his or her desk at all times. Here’s a management tip. Don’t give these handsomely-bound books to your consultants without enhancing loyalty by the simple task of dating, signing and inscribing the book individually. For example, “To Bob… a future superstar” or “To Susan, to help you go from Good to Great!” Then sign your name. Every time your consultant references this book (which will be a lot), he’ll be reminded of your confidence and belief. This attractive hardbound book is only $45 plus $4.00 postage. Order six books, and the price drops to $40 each plus postage. Larry Nobles was an absolutely top-notch experienced industry trainer. Steve Finkel’s insightful editing has brought you a well-written up-to-date book of in-depth knowledge guaranteed to increase every consultant’s production. We can’t recommend it highly enough. A double-thumbs-up to Larry Nobles and Steve Finkel for a work of great and enduring value for every recruiter!